Sickle cell anemia symptoms cause blockage of blood vessels in feet and hands which can cause swelling. Spleen may trap abnormal red blood cells, thus grow large and cause anemia. Blood transfusion is needed if spleen traps many red blood cells. 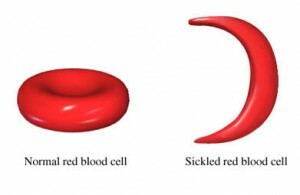 Sickle cell anemia usually damages spleen. In this case, there will be chances of infection and need immediate sickle cell anemia treatment. Breath shortness occurs in pulmonary hypertension. Stroke causes death in patients having sickle cell disease, which is caused due to blockage of blood vessels. Anemia is a common complication in sickle cell disease. Detachment and scarring of retina occur due to damage of eye blood vessel, which can cause blindness.